A- nurses a lot in bed. I keep my phone handy and I write when she doesn’t want to let me go. I also jot quick notes throughout the day so that I don’t have to keep them in my head. These go into the nearest synchronized device. It’s hard to remember the context for those notes if too much time passes. A daily verbal recap for W- and a weekly summary for my blog seem to be just the right balance. Anything older than a week gets too fuzzy, while writing detailed notes every day takes too much time away from other things I’d like to do. Monthly reviews give me a better perspective on big changes. It’s hard to keep enough in my head when I’m reading or writing on my phone, so I need help summarizing a month’s worth of highlights. 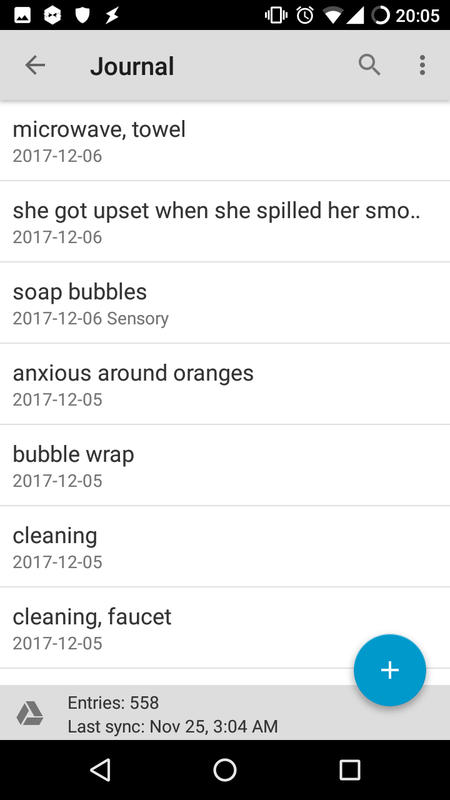 I set up Memento Database on my phone and on a backup Android phone. I picked it because it can synchronize between phones in the background, and it can also sync with Google Sheets so that I can process things further. Category: single value from a list. Most of my entries go into Gross Motor, Fine Motor, Language, Self-care, Other, or Us, and I add other categories as needed. Highlight: a number indicating the level of review this should be included in: 1 – weekly, 2 – monthly, 3 – yearly. 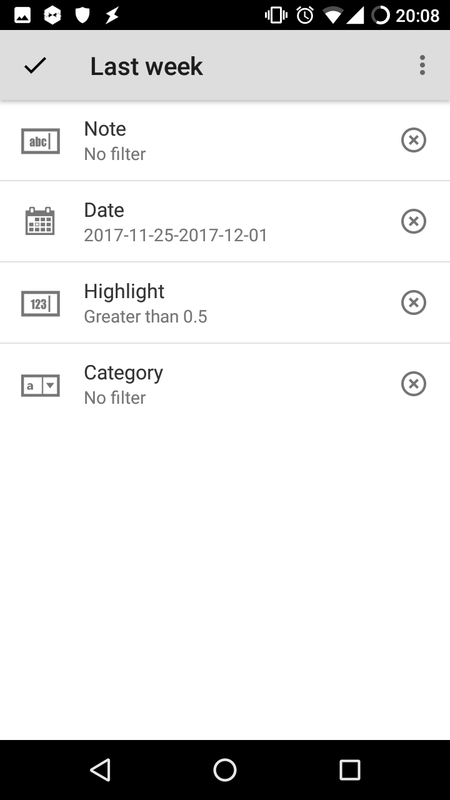 I display this field as the status, so that it shows up on the right side. 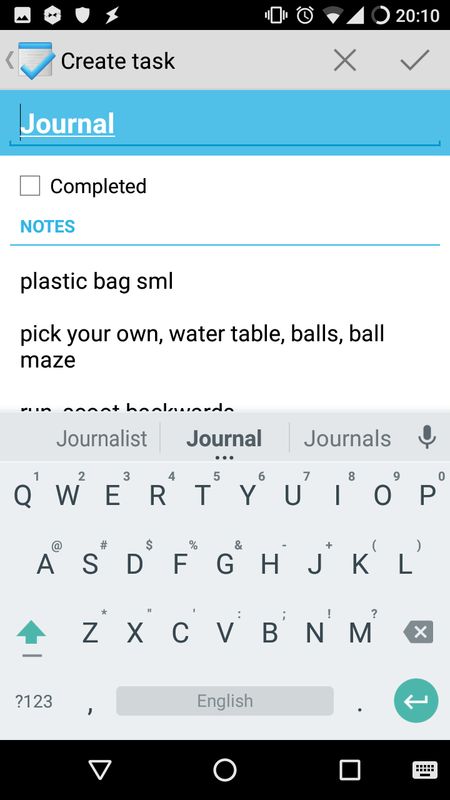 I have a shortcut on my home screen so that I can quickly add a journal entry. I normally sort the list by date, with recent entries on top. As part of my weekly review, I look at recent entries, fill in any categories I skipped, and choose a few to highlight. For example, last week, I wrote 17 entries and I chose 13 to include in the weekly review. 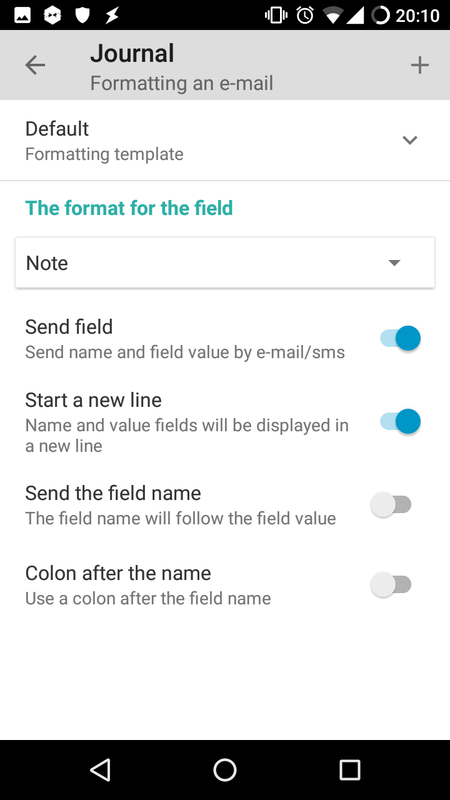 I configured Memento’s default export formatting to include only the Note field and to export that without the field label. 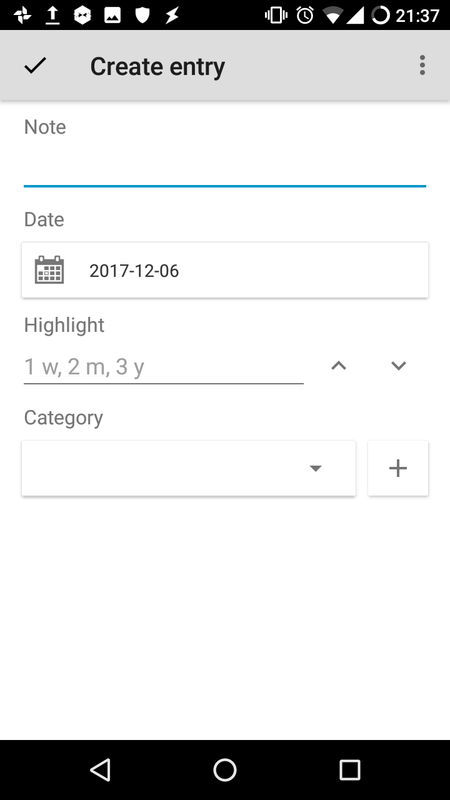 I filtered the database to show only the entries within a given date range where the highlight value was greater than 0.5. I grouped it by category so that similar entries were together. This was better than fiddling with the sorting, since this takes fewer taps to set back to my default view. After filtering and grouping the entries, I used the “Send all > Send as text” command to send it to Tasks Free, which is a task manager that synchronizes with Google Tasks. 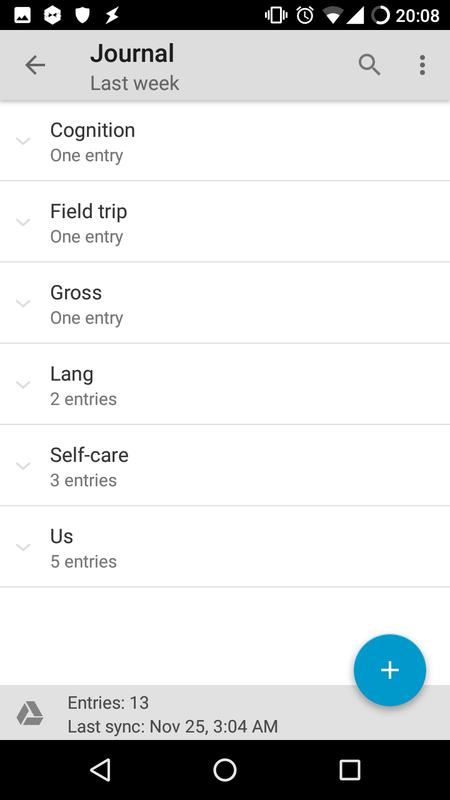 I like the way I can drag-and-drop tasks to reorder them, which makes prioritizing so much easier on my phone. I edit the text in Tasks Free, turning the keywords into paragraphs and moving things around for better flow. After drafting the body of the post (and possibly switching between phones, if my battery ran low), I select all the text, copy it into the WordPress app, set the categories and the title, and post the entry. The monthly review process is quite similar. I start with a filtered view that shows all entries for last month (133 entries in November), and I group it by category. I skim all the entries, not just the ones included in the weekly review, because sometimes little moments turn out to be significant or part of a bigger pattern. After setting the highlight values for the things I’d like to include in my monthly review, I switch to another filter that shows me last month’s entries with a highlight value greater than 1.5 (28 entries in November). I send it all to Tasks Free, edit the post, copy it into WordPress, and publish. If I manage to squeeze in some computer time, I use Google Tasks to copy the text into Emacs and then use my regular Org Mode review/publish processes. I’ve been thinking about how I can improve this workflow. Sending text to the WordPress app doesn’t seem to work (the text disappears after I save or publish), and it’s kinda nice being able to move my weekly review task around on my task list in order to accommodate other priorities. I also like the way Google Tasks keeps the data from completed tasks, which has come in handy a few times. Tasks Free editing is more responsive, too. Synchronizing with Tasks Free seems to be more robust than synchronizing with Orgzly, since I only have to watch out for editing the same task on two devices instead of watching out for the whole file. I’d like to get back to drawing the weekly and monthly reviews, but maybe that can wait until A-‘s sleep is more settled and my discretionary time is more consolidated. The visual journals are more fun to flip through, but the bulk and chronological views I hacked into my WordPress theme are reasonable workarounds.